I was at Denver International waiting for my flight to Burbank. It was already on the screens as over an hour late, and it was the last flight out, so I was feeling nervous. The lady at the gate came on the loud speaker and announced that while it wasn’t officially canceled, unofficially it looked likely it would be. Her advice for the 50 people waiting was to head to the one customer service desk they had manned and sort something out with them. "Discounted hotel rooms" was one of the less-than-appealing offers mentioned. That resulted in a stampede in that direction, but I remembered the advice I’d received from veterans of business flying. Avoid the service desk at all costs, because if you’re stuck, so are loads of others, and you’ll end up spending hours standing in line. I was determined to get home that night, so I started working on my other options. There were no more flights to Burbank, but Liz was picking me up so I could fly into LAX instead, which opened up several direct flights. I figured out what the next one I could catch was, and tried to use my iPhone to book it through the internet. The United site wouldn’t let me book that close to departure, but Expedia appeared to. I went ahead and booked the flight I wanted, and then headed over to a bank of self-service check-in machines to print out a ticket. After some futzing trying to use my confirmation number, I realized Expedia had actually bumped me onto the flight at the same time the next day, ignoring the date I specified, and I’d missed that in my rush. Next up was a trip to the bank of phones that went direct to the United reservations system. They also couldn’t handle a booking that close to departure. At this point it was only 30 minutes before the flight I wanted left, so I was getting worried. I walked past the customer service desk, and sure enough there was still a massive line. Finally, I went directly to the gate where the LAX flight was leaving from. There was only one person in line at the desk, also a Burbank refugee. She booked onto the flight, though her luggage wouldn’t be following. I walked up, and I only had carry-on, so the attendant was able to print me out a ticket and get me a seat in under a minute, all for no cost since I had my Burbank boarding pass. I so pleasantly surprised I was grinning the whole flight home. My high hopes of technology didn’t work out, but that advice I’d got about avoiding those customer service lines definitely paid off. There was a big earthquake just a few minutes ago. We’re on the west side of LA, so there’s no noticeable damage, but it looks like a 5.6 according to the USGS, so Pomona and that side may be hit pretty bad. I was feeling fairly cocky after the last few years of regular road-biking, and wanted to try something ambitious while I was here in Boulder. Climbing 2000 feet up Flagstaff Road and then taking the Walker Ranch Loop sounded like a good way of stretching myself. I didn’t count on quite how stretched I’d be by the end. I got a 9:15am start, a bit later than I’d planned, but still not too hot. The ride up Flagstaff was tough, but I took it slow and drank plenty of water, since I knew I had a long way to go after that. The steepest section was the first half, before the auditorium turnoff, but it was a relentless grade all 7 miles to the top of the ridge. After catching my breath, I headed down the other side to find the Walker Ranch trailhead, and was a bit worried by how far I had dropped by the time I got there. The entrance to the property was signed, but I ended up taking a wrong turn and getting scolded by a genuine cowboy at the historic homestead site for taking my bike in a no-bike zone. After being pointed in the right direction, I found the parking lot, and set off left to do the loop clockwise. The first mile or two was rocky single-track, which climbed a little before plunging down to Boulder Creek. As I was headed further and further down, I realized it would be a tough climb back out of the valley. Once I hit the creek, there was a bridge and I got to rest and enjoy the white water crashing down the canyon. After the bridge, there was a really steep cliff climb of a few hundred feet. I had to carry my bike up steps for most of it, and that took its toll. Then there was a crawl up to another ridge, before heading back down again and crossing the creek again. By this point, I realized I was getting irritable for no good reason, a possible warning sign of dehydration, so I stopped again in the shade and made sure I drank plenty. I was less than 2 miles from the trailhead, but a long way below. It was getting into the high 90’s by this point, and I walked a fair part of the final climb, taking plenty of breaks in the shade and getting through more water. When I finally made the parking lot, I crashed out under a tree for 20 minutes, and thought about my next move. I’m used to biking in the California summer, so I had brought a lot of water, but I finished off the last of it there. I only had a couple of miles of road-riding to make it to the ridge on Flagstaff and then I’d be able to coast back to Boulder, but I knew I without water my margin of safety was shrinking. In the end I decided to take it very easy up the road, with lots of breaks, and keep an eye on myself for signs of heat exhaustion or dehydration. In the worst case, it was a well-travelled route with houses nearby, and I might have to ask for help. That last climb was just as tough as I’d feared, but taking it slow I was able to make it to the top of Flagstaff. That was such a great feeling, I shot back down to Boulder in less than half an hour. I returned my rented bike, and by an act of god there was a Coldstone Creamery next door. I don’t know if ice-cream is the best thing for dehydration, but I’ve never tasted anything so good. What should have been a 4 hour ride turned into 6, and I made some rookie mistakes; failing to take into account the difference the altitude would make, not checking the weather forecast, bringing too little water for the conditions. If you’re looking for a tough ride out of Boulder, it has some amazing views and great technical single-track on the loop, but be smarter than me and make sure you’re prepared! Everybody knows Boulder’s a great city for mountain biking, but I never realized there were even fatter tires on the Boulder Creek whitewater tubing course. All you need is a tire from the gas station on Arapahoe and Broadway, then head down to the creek at Eben G Fine Park, and take a wild ride. If you’re visiting Boulder and want to explore the mountains on traditional fat tire, there’s a couple of options for renting one. Rob from Eventvue pointed me towards University Bicycles, right in the center of downtown on Pearl Street, but they were out of mountain bikes when I got there. They were kind enough to recommend the Boulder Bikesmith, about 1/2 mile from the city center, in the mall on the corner of Arapahoe and Folsom. They sorted me out with a Giant XTC1 in good condition, charging about $55 for two days. The lock and helmet were included, but there’s no cages on the pedals or bike computer, both of which I missed once I hit the climbs. I had no clue where to go, so I hit the Boulder Book Store on Pearl Street and discovered Bicycling Boulder by Burt and Terry Struthers. This is a fantastic little guide to a whole bunch of local trails for road and mountain bikes, with short but clear descriptions, they’ve obviously spent a lot of time on the routes themselves. The only drawback is that their maps and elevation charts are obviously taken directly from their GPS systems, with a few very basic additions, so you may want to pick up a separate map. I didn’t, but there were a couple of points on my ride today where I was unsure if I was on the right path, and wished I had. That evening I started out gently, taking the Boulder Creek trail. 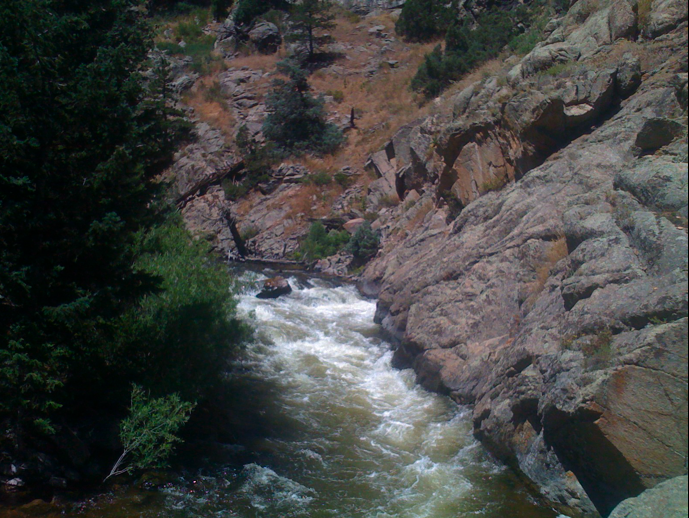 It runs alongside the stream for about 5 miles, from one end of Boulder to the other. With no street crossings and little grade it’s a smooth ride the whole way. It parallels Arapahoe, with ramps onto it from most of the side-street bridges that cross the creek. Today I had some time free in the afternoon and wanted to go a bit further afield. I’d had lunch with Andy Sautins from Return Path, and he recommended the Poorman Road loop. In the Struthers book this is listed as a variant of the 9th ride on Sunshine Canyon, and is mostly asphalt with a couple of miles of gravel fire road. It’s close to town, so I was able to get to Mapleton Avenue and then continue west as it turned into Sunshine Canyon. Poormans is a dirt road, but it’s in very good shape. It started off level, and then headed more steeply downhill, but it was so smooth I had an exhilarating descent for 2 miles, hardly touching the brakes. That led to the Four Mile Drive asphalt road, which the joined Boulder Creek Road and came back into town. The single best thing about PHP is how easy it is to embed HTML within your source files. This makes writing user-interface oriented code incredibly easy, since you can prototype both the presentation and the logic of your pages in the same file. As always though, there’s a price, as I discovered after some serious head-scratching yesterday. All the executable code in a PHP file is enclosed in special <?php … ?> blocks. A typical project will have a bunch of included PHP files, with the each file internally enclosed in one of these tags. Anything in those files that’s outside the tag is printed verbatim to the standard output, usually the user’s web browser. That means if you have a new line after the closing tag in an include, that will be printed to the output. Normally that’s not a problem, floating carriage returns are generally treated as whitespace and ignored in HTML, so it doesn’t make a difference. What if you’re actually trying to pass binary data to the user though? In my case, I’m fetching a mail attachment from a database, setting up the appropriate MIME content type and then printing it to standard output to be downloaded. That nearly invisible new line at the end of one of the include files gets output first, which royally confuses most binary formats, making them unrecognizably corrupted. Once I figured out what was going on, I did a sweep through my includes and removed any trailing new lines, but I could also have called ob_clean() to wipe the output buffer before I wrote out the file data. There’s a good treatment of the whole topic of file downloads in PHP here, but it feels like the deeper lesson is about using the right tool for the job. PHP is extremely fast to prototype web apps in because it is totally focused on the task of producing HTML pages, but once you’re dealing with arbitrary data, Perl or Python sure start to look pretty.